To test the efficiency of the helmet retention system. Designed and manufactured to meet ECE22.05 regulation. Can be adapted to other Standards. Operated by either Cadex Software or Touch screen controller technology. It is recommended that all our testing equipment be used in ideal working conditions (18 - 29 degrees C and less than 65% humidity). 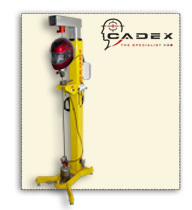 Can be connected to a computer system in order to measure the real time displacement.Cadex Aquisition Software has been developed to monitor this signal system. 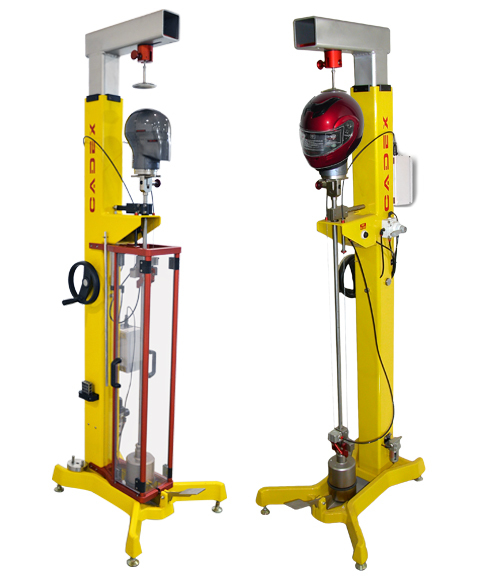 Important notice : The supporting legs are adjustable and should be used to make sure that the guiding system is leveled. The guiding system is the most important part of the machine so it will be more important to make sure it is leveled, rather than the machine frame. Width : 62 cm (24.4 inches). Height (adjustable) Min : 298 cm (117.3 inches). Depth : 70 cm (27.6 inches). Weight 78.47 kg (173 lbs).